In the top flight, holders Cork and All-Ireland champions Dublin are safely through to the last four, where they’ll be joined by two other counties, with Galway, Mayo and Donegal in the hunt. It’s two from three also in Division 2 to join Tipperary and Waterford in the last four, with Ulster trio Tyrone, Armagh and Cavan in the running. Antrim’s game with Derry is pencilled in for next Tuesday, with ten other matches to be played before then. Donegal currently boast the best score difference of the trio (+50), compared to Mayo (+9) and Galway (+8) ahead of the weekend’s games. Donegal’s weekend meeting with Cork is the first time that the counties have clashed since last year’s classic League final at Parnell Park, which the Rebelettes won by just a point. A win for the Sky Blues would take them back to the summit, temporarily at least, before Cork’s visit to Donegal. If Dublin and Cork both win, they’ll be level at the head of affairs on 18 points each, but Dublin would finish the group stages at the head of affairs, having beaten Cork at Croke Park at the start of the campaign. 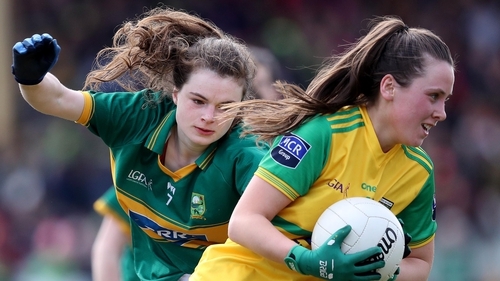 So there’s still a lot to play for as already relegated Kerry make the trip to DCU, St Clare’s, on Saturday afternoon. Galway know what they have to do ahead of Sunday’s visit to Westmeath – and that’s to claim maximum points. If they do that, and Donegal beat Cork, they’ll finish ahead of Donegal in the standings under rule, provided that Mayo don’t draw with Monaghan to make it a three-way tie. A home win for Mayo will ensure a League semi-final spot for last year’s TG4 All-Ireland senior final runners-up. It’s been a mixed bag of a campaign for Peter Leahy’s charges, who’ve won three, lost two and drawn one. But they were awarded three points when Kerry fielded an unregistered player and that’s boosted Mayo’s table position considerably. Instead of being in a position where they had to rely on results elsewhere, Mayo’s top four destiny is now in their own hands. Visitors Monaghan staved off the threat of relegation for another season and will be looking to finish their League campaign on a high, ahead of the summer’s championship campaign. Even a point at home to Armagh will be good enough for Clare but the visitors need the points desperately as they’re still in the hunt for a top four finish. For now, though, there are important League points at stake and there’s also a distinct possibility of a repeat meeting in the knockout stages. Sligo are currently bottom of the pile, without a point from six outings, but they’ll face off against second from bottom Laois, who are three points ahead of them. However, even if Sligo do win, they’re likely to go down if the Yeats County, Laois and Clare all finish on three points, due to an inferior score difference. Both sides have been scoring heavily but Tyrone have leaked more than Sunday’s opponents. Offaly can’t make the top four while Wexford are safely through. Anthony Masterson’s Wexford can’t be caught either at the head of affairs but they’ll be anxious to sign off the group stages with maximum points. It’s an anxious wait for the Saffrons to play the outstanding fixture in the group stages of Division 4 but they do know what’s required. They’re three points behind Fermanagh as things stand but victory over Ulster rivals Derry would see them edge out the Ernesiders on the head to head rule.